Organizers of an electronics recycling drive in Bloomington abruptly canceled the event Friday after collecting more e-junk in one day than they'd anticipated collecting over the planned three-day drive. "It was mostly a safety concern," according to David Kutoff, the chief executive officer of Materials Processing Corporation of Eagan, the firm in charge of collecting the electronics. Thousands of cars jammed the streets around the Mall of America, extending back to the I-494 ramps on 24th Avenue, as consumers rushed to rid their homes of stockpiled electronics. "This is an electronics tsunami," said Jim Kordiak, an Anoka County commissioner and one of the architects of a Minnesota law requiring manufacturers to recycle three-quarters of a pound of electronics for every pound they sell. "This is a perfect example of what we've been trying to tell the manufacturers," Kordiak said. "I'm grossly excited that we have more evidence that the public recognizes the need to dispose of electronics safely, but I'm sorry there aren't more locations for people." "I'm not surprised," said Kutoff. "I'm more encouraged by the number of people who took the time and effort to make sure the electronics were recycled properly." Kutoff estimated collecting 1.5 million pounds of e-waste, in a little more than a day. He said he had anticipated collecting 1.2 to 1.5 million pounds over three days. Twenty cars were lined up outside the makeshift collection center in a mall parking lot at 5 a.m. Friday. During the drive, however, there was no traffic control, and some drivers ran short of patience in waits of as long as two hours. Kordiak says the outpouring is the proof he needs to convince manufacturers to make e-recycling easier. The manufacturers contracted with Materials Processing Corporation to handle the recycling. 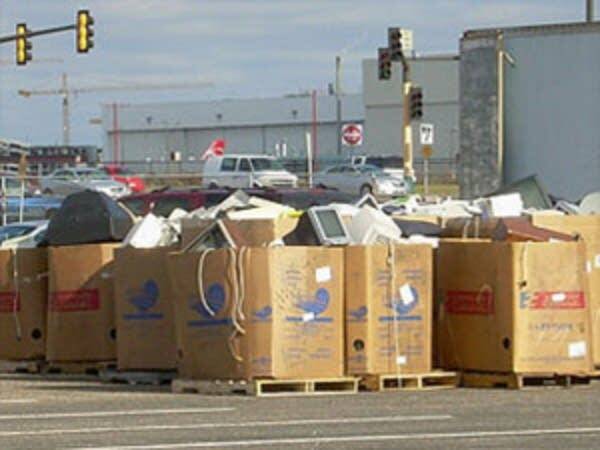 The end of the drive came as a national recycling coalition called on TV manufacturers to make it easier for American consumers to dispose of aging TVs and other electronics. Just 12.5 percent of electronics waste in the U.S. is offered for recycling each year, according to the Environmental Protection Agency. At least half of that amount -- more than 160,000 tons -- is exported and dumped overseas, according to Robin Schneider, the vice chair of the Electronics TakeBack Coalition. Some environmental activists question, in general, the value of recycling efforts. They estimate that 60 to 80 percent of the 300,000 to 400,000 tons of electronics collected for recycling in the U.S. each year ends up overseas, shipped there by recyclers collecting the e-junk for the manufacturers. Many activists believe the answer lies in requiring electronics makers to take back and recycle their own products. They say that would encourage the manufacturers to make their products of materials that are more easily recycled. David Kutoff, the chief executive officer of Materials Processing Corporation, says while he's aware of the reports of recycled electronics being dumped in third world countries, his firm takes steps to prevent that. "We are certified to the standards that apply to electronics recycling and we audit everyone that we do business with to be sure that material is being recycled properly," he said. Kutoff said so much of the material his firm collects is recycled or reused that "we don't even own a dumpster." Because of the turnout in Bloomington, Kordiak expects manufacturers to increase their recycling effort. "Every one of 40 manufacturers is running around in Minnesota right now, trying to build relationships with people who can responsibly recycle electronics," Kordiak said. Bob Collins writes the News Cut blog for MPR News.